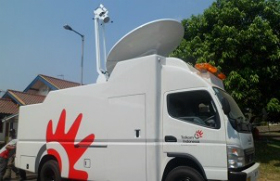 Indonesia's PT Telekom selects Kyrion encoders for SNG vehicles. Paris, March 2015: ATEME has announced that PT Telkom, Indonesia’s largest telecom company, has selected the Kyrion CM5000 encoder to outfit its expanding Satellite News Gathering (SNG) vehicle fleet. As the company looked to upgrade the quality of and broaden its satellite services, PT Telkom consulted with ATEME’s local partner, PT Aditech Matra, to assist it in selecting the best video compression solution for its fleet of SNG vehicles. They selected the ATEME Kyrion encoders for their outstanding VQ performance and bandwidth efficiency. Kyrion CM5000 encoders are designed to streamline DSNG and Occasional Use uplink operations. With a very short boot time and a unique front panel with confidence monitoring, the Kyrion CM5000 allows SNG vehicle operators to load or edit transmission profiles rapidly and be on air within seconds.